I can look at Agincourt now and then with objectivity. Not often; just now and then. Objectivity and I are sparing partners, not friends. What the project needs now—desperately, I should add—are contributions in the areas of landscape and infrastructure. Landscape concerns include the cluster of cemeteries (Catholic, non-denominational and Hebrew), the two public squares (what I view as its primary manifestations to testosterone and estrogen), and the Fennimore County fairgrounds. I could do these but you wouldn’t like the results. Trust me. Then there is the Highway 7 Strip, the northern edge of the Original Townsite where the state highway skims past on its way from Pocahontas toward Storm Lake. It originally routed through town on Agincourt Avenue, but that’s the half-mile divisor of the section, not its edge, where highways traditional locate. At some point, that northern edge of the O.T. went from ragged to rugged, as commercial development (auto and implement dealerships, for example) moved from breathing room; where the drive-in movie set up shop and the Tastee Freeze located. The municipal maintenance garage was already there, so its transition to Yellow Brick Roadhouse was a simple one. Less impulsive and largely unseen, but no less important than traffic, would be the various civil-engineered aspects of development: municipal sewer and water systems; sewerage treatment, and bridges. I’ve mentioned bridges before. There would have been several for different sorts of traffic: horse-drawn wagons and carts, automotive (cars and trucks); railroad; pedestrian and a very special bridge across the Muskrat for the trolley system’s seasonal service to the fairgrounds. Nineteenth-century bridge engineering was more often than not a seat-of-the-pants operation: if it stood, you knew you could do it again; if not, back to the drawing board. I liked the bridge photo shown above, both for its off-handed technology, and also for the creek bed and entourage. So with very little tweaking, this image will serve as the Milwaukee Road bridge across Crispin Creek coming in to the city from the southeast. Avenue Bridge—Agincourt Avenue extends westward across the Muskrat. Broad Street Bridge—Broad Street bridge extends southward across Crispin Creek. Fairgrounds Bridge—NITC trolley tracks extend westward from Ralph Avenue to serve the Fairgrounds across the Muskrat. Gnostic Bridge—From the intersection of Thoreau and SE Sixth Street, Gnostic Bridge crosses Crispin Creek and connects with the section-line roads. Highway 7 Bridge—Highway 7 at the northern edge of the Original Townsite continues westward across the Muskrat and runs along the north edge of the county fairgrounds. 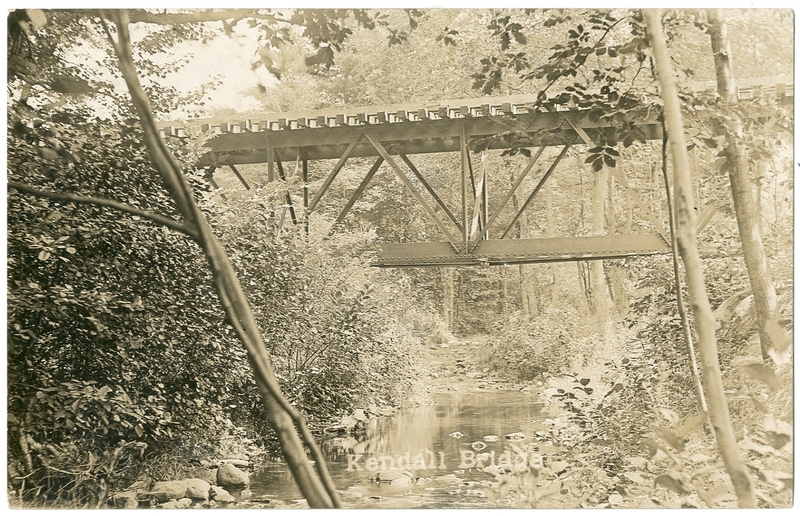 “Lovers’ Leap”—Pedestrian suspension bridge across the Muskrat between the Normal School / NIN and the fairgrounds. Railway Bridge—Milwaukee Road mainline tracks run along the southern edge of the Original Townsite and then cross the Muskrat near the Old Mill. By agincourtiowa in Uncategorized on Thursday/09/October/2014 .